In present-day Russia, ruled by blue-eyed, unblinking President Vladimir Putin, Russian intelligence officer Dominika Egorova struggles to survive in the post-Soviet intelligence jungle. Ordered against her will to become a "Sparrow," a trained seductress, Dominika is assigned to operate against Nathaniel Nash, a young CIA officer who handles the Agency''s most important Russian mole. As the action careens between Russia, Finland, Greece, Italy, and the United States, Dominika and Nate soon collide in a duel of wills, tradecraft, and-inevitably-forbidden passion that threatens not just their lives but those of others as well. As secret allegiances are made and broken, Dominika and Nate's game reaches a deadly crossroads. Soon one of them begins a dangerous double existence in a life-and-death operation that consumes intelligence agencies from Moscow to Washington, DC. Occasionally I like to change up my reading routine with a good spy thriller. Enter Red Sparrow; the debut effort from Jason Matthews who is a 33-year veteran of the CIA. Red Sparrow is not filled with action sequence after action sequence but it does not need this to completely engage the reader. I love Ludlum's Jason Bourne series like everyone else but Red Sparrow is at another level. More similar to le Carré's Tinker, Tailor, Soldier, Spy. Psychological, crafty, multi-layered. There is superior characterization, a grittiness and bleakness to the writing. The author is very patient at evolving the story of the main characters. You are given a lot of information about the business of spying, the relationships, tensions and twisted motivations of the characters and none of this description is superfluous or boring. There are jewels of tradecraft language sprinkled throughout. As a reader the story felt to me like looking through a telescope sharply in focus. Red Sparrow was immersive, compelling, undeniably honest and chilling. The book's summary does not do this novel justice. If you are attracted to spy thrillers, this novel is worthy debut into the genre and a must read. I also recommend Red Sparrow to those who have an interest in American-Russian relations and politics. Whoever dares to seek the firebird may find the journey—and its ending— unexpected. Nicola Marter was born with a gift. When she touches an object, she sometimes sees images, glimpses of those who have owned it before. It’s never been a gift she wants, and she keeps it a secret from most people, including her practical boss Sebastian, one of London’s premier dealers in Russian art. But when a woman offers Sebastian a small wooden carving for sale, claiming it belonged to Russia’s Empress Catherine, it’s a problem. There’s no proof. Sebastian believes that the plain carving—known as “The Firebird”—is worthless. But Nicola has held it, and she knows the woman is telling the truth and is in desperate need of the money the sale of the heirloom could bring. Compelled to help, Nicola turns to a man she once left and still loves: Rob McMorran, whose own psychic gifts are far greater than hers. With Rob to help her “see” the past, she follows a young girl named Anna from Scotland to Belgium and on into Russia. There, in St. Petersburg—the once-glittering capital of Peter the Great’s Russia—Nicola and Rob unearth a tale of love and sacrifice, of courage and redemption . . . an old story that seems personal and small, perhaps, against the greater backdrops of the Jacobite and Russian courts, but one that will forever change their lives. Have you ever read a book and thought after finishing it that the work embodied everything a work of fiction should be? That was The Firebird for me. I have read all of Susanna Kearsley's previous novels so maybe I am a bit biased. Its not often I read a book and get totally lost within it. (In a previous occupation I was a copy editor so I'm used to picking apart inconsistencies and finding errors.) The Firebird perfectly encapsulates its intention, to be a superior work of timeslip fiction. 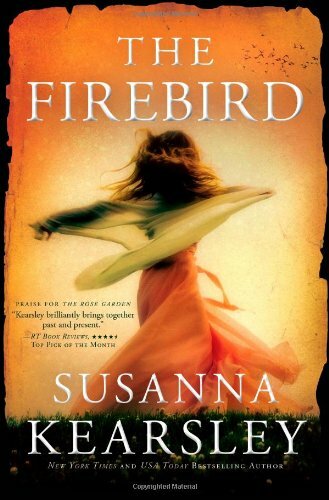 I never thought Susanna Kearsley could out do herself either but with The Firebird she does. The present day main characters are Nicola Marter and Rob McMorran. (Although not mentioned anywhere in the novel, Rob McMorran was the boy Robbie who had special paranormal gifts in Kearsley's novel The Shadowy Horses.) The Firebird is a sequel to the historical characters in The Winter Sea...and both stories have connections to each other on multiple levels, although The Firebird works well as a standalone read. I would get frustrated with Nicola's character at times for not being stronger...and at Rob's character for not pushing Nicola enough...but then you understand their motivations at the end. Plus Anna's story in the historical part of the novel has a very satisfying conclusion to the historical events in The Winter Sea. The story unfolds so naturally that the surprises leave you feeling wonder at Kearsley's cleverness of revealing information. I had just reread The Winter Sea and I was still caught flat-footed at times as The Firebird unfolded. Anyways its hard to discuss the story without revealing spoilers, so I think its best if you read the story yourself! Highly recommended for adult reading. Must read for Kearsley fans. This book will make you want to read her entire backlist, which I highly recommend as well. Beautiful Deborah Grantham, mistress of her aunt''s elegant gaming house, must find a way to restore herself and her aunt to respectability, preferably without accepting either of two repugnant offers. One is from an older, very rich and rather corpulent lord whose reputation for licentious behavior disgusts her; the other from the young, puppyish scion of a noble family whose relatives are convinced she is a fortune hunter. I so love Georgette Heyer!! I have read almost all of her "romance" and historical offerings now. Faro's Daughter is a much shorter story with more angst and passion, less sweetness compared to her other novels. The hero and heroine try to get the best of each other with misunderstandings along the way. Also the heroine is a faro dealer in her aunt's gambling room, not the stereotypical life of a gentlewoman for that period of time. Highly recommended for Heyer fans and a great book to start with as a first Heyer read. I have read most of Tami Hoag's novels and I'm not sure why I waited so long to start reading her Deeper than the Dead/Oak Knoll series. All three books are now out in paperback. I do love a good thriller, especially with a sliver of romance. Tami Hoag, in my opinion, surpassed all her previous efforts with Deeper than the Dead. What makes DTTD so chilling and unique are the POVs from the four children who came across the dead body in the park. There are a great cast of characters, which include the parents of the children, and we get to briefly see their POVs as well. Identifying the villain is not so easy. The story has been edited very well and is the perfect length. The main thing to know about DTTD is that its set in 1985, before DNA testing and technology became prevalent...even before behavioural profiling became standard procedure in serial killings. The 80s setting feels very authentic. I find the story even more interesting when compared to all the technological advancement we have today. Bar none: this is a perfect thriller and great start to the Oak Knoll series. The second book is Secrets to the Grave, the third Down the Darkest Road. When I started this blog my intention was to write about books that I had definite thoughts and opinions for, books that I was passionate about and be able to have my comments kept for posterity, secondary to that was recommendations and sharing my thoughts with others. My blog was always about giving my inner thoughts an outlet. A digital journal of sorts so these thoughts would not continuously rattle around in my head...more for my own satisfaction than reaching out to others. I guess some would say bloggers blog to establish connections with external social communities but this has never a priority for me (sorry!). At the end of 2010 I was finding blogging more of a chore and reading became less enjoyable because I would tend to think about the comments I wanted to make on the blog while reading...or I would put the book down to note my thoughts, which detracted from the simple pleasure of absorbing the written word. At that time I also entered library school. Going to graduate school in my thirties was an amazing and fulfilling experience...but it did take time away from blogging. I tried sporadically to blog about the classes I was taking and posted an odd review once in a while. Have you ever lost your inner voice? I went through some devastating experiences in my personal life this spring, which crushed my inner spirit. Where once I had been able to articulate thoughts and feelings, I found myself unable to communicate verbally to even those closest to me. My inner spirit is coming back in increments and I am now trying to reconnect with those activities I once loved. So, my plan is to post reviews sporadically on books that I have enthusiasm for and definite thoughts about and we will see if my inner voice has returned for good. In my last term in graduate school, I had little time for recreational blogging but I did make time to read for fun. Over the past few months, I read the below novels from Georgette Heyer - one can always rely on Heyer for amusing and lighthearted prose - and I have provided a few thoughts for each! With the heir recently deceased, the Darracott family expect the new heir to be a vulgar person of little means...Major Hugo Darracott is not quite what they expect. The hero, Hugo Darracott, is one of my favorite Heyer heroes. I have difficulty even describing how wonderful this character is. Think how perfect Jane Austen's Darcy is, even though he is arrogant in the beginning. Well Darracott is humble and capable but with an iron will! A perfect foil for the strong-willed and beautiful heroine Anthea. I found myself giggling a lot reading this one. Highly recommended. This story is out of the common way for Heyer, as she actually explores marriage rather than courtship or rollicking adventures. A Civil Contract is really quite wrenching, as you feel for the heroine Jenny Chawleigh, who is plain and plump. Adam Deveril is marrying her because she is an heiress and the family fortune is gone. I recommend for Georgette Heyer fans but I wouldn't recommend as a first Heyer read. Similar to A Civil Contract, the main characters, Nell and the Earl of Cardross are already married except the Earl has married Nell by choice, even though members of Nell's family are inveterate gamblers. Nell is keeping secrets from the Earl and finds herself ever deeper in trouble with no seeming happy resolution in sight. Much unhappiness is experienced by the hero and heroine due to poor communication and frequent misunderstandings. There was much more angst in April Lady than in Heyer's other novels, maybe the reason why I did not enjoy this novel as much as I usually enjoy a Heyer novel. This story follows more the lines of The Reluctant Widow in that it is much more suspenseful, with hints of romance interspersed. A satisfying mystery. 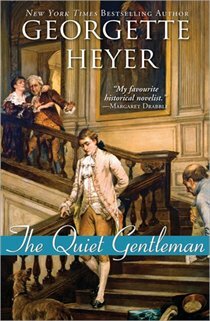 These short stories are quick reads at 20 pages apiece, yet Heyer does well in creating memorable characters and exciting plots in so few pages. Recommended for Heyer fans. The writing seems to be a bit more hectic in Sprig Muslin than in other Heyer stories. I would have liked more scenes with Lady Hester and Sir Gareth Ludlow. Recommended for Heyer fans but if you are just starting to read Heyer, this is not her best effort. I just want to mention how much I love the Sourcebooks Landmark releases of the Georgette Heyer novels and I have almost finished collecting all of the romance titles and some of the historical titles. I would snap them up if you find the print versions, as the bookstores tend to sell out of copies. Like many of you, I am obsessed with books and have been from a very early age. I have always loved the smell of new and old books and have been known to hang out in Chapters and used bookstores for hours eyeing up the stacks, waiting for the next colourful or striking cover to catch my eye.